ContactPro is a clumsy $1 contact management app from LufiStudio. 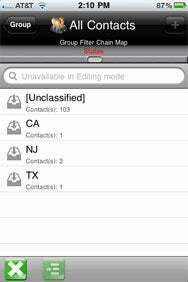 Sorting Things Out: ContactPro lets you organize and filter contacts by one of several fields, including the state in which they live. When you first launch the app, it recommends that you read through the in-app Help. Unfortunately, the Help text is a bit challenging to decipher. Things only got more confusing as I attempted to use the app. ContactPro aims to let you organize and filter your contacts by one of several fields—organization, department, title, country, city, or state. This works, to a degree, though the process feels a bit ham-fisted. When you’re viewing a group—say, people at Macworld, or people in New Jersey—you’re supposed to be able to e-mail them all at once. I couldn’t successfully test this feature, since the app crashed each time I tried to do it. Adding to my overall disappointment with ContactPro is one more especially glaring weakness. Whenever you use the app to change, move, or add a new contact, the app reports that it’s detected an “external” change to the Address Book database, and must thus return to the ContactPro home screen. That makes any kind of bulk editing rather unpleasant. I could imagine relying on ContactsPro in a pinch if you absolutely needed to find all your contacts in a given state in a hurry. But it’s so complicated and buggy that I can’t really recommend it at all.